TransCR is a four day enduro stage race through the Costa Rican jungle. High mountains, lush jungle, remote locations and unspoiled singletrack make the TransCR a truly unique enduro experience. We invite you to come and enjoy a week of remote riding and camping in Costa Rica's beautiful jungle forests. 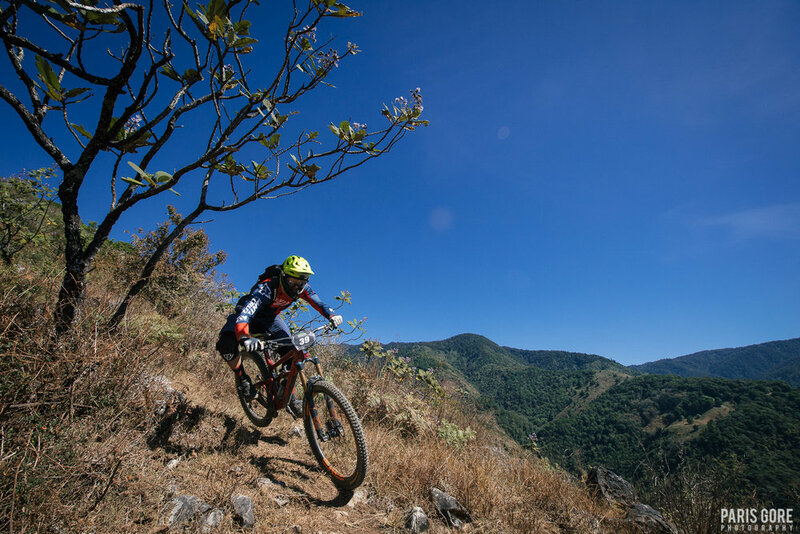 Escape from the winter and come ride sweet trails in Costa Rica! Unspoiled jungle singletrack, camp vibes, fresh food, live Pura Vida! We are excited to move the TransCR to a brand new northern location for 2018. New locations means new trails and an authentic blind racing experience for all participants. You will sleep in tents and a fully equipped basecamp will be provided. Expect campfires, swimming holes and a laid back camp vibe and of course a well stocked bar. Breakfast and dinner will be provided daily along with snacks and lunch items during the race. Awards banquet and closing dinner will end your time at camp. Accomodation before and after the race will be at Barcelo hotel San Jose. The race area and route will be announced closer to the race. We are excited to be bringing racers to a brand new area featuring the steep jungle loam descents that Costa Rica is famous for. All stages will be raced blind with no pre-ride or walk. Expect varied terrain from steep jungle gnar to smooth jungle flow and the occasional high-speed backroad. Stage lengths will vary from 4-15 minutes, with 3 to 4 stages per day plus a prologue on day one. Riders should be comfortable spending 3-6 hrs in the saddle with as much as 1500m of climbing in one day. Transfers will be a mix of pedaling and shuttles to maximize daily descending. Costa Rica’s mountains are steep and unrelenting so solid technical riding skills are a must. Costa Rica is easily accessed from anywhere around the world. You will need to land yourself in San Jose on the 20th of February. Accommodation will be provided at Barcelo Hotel the evening before we depart for the race camp. Racers will be returned to Barcelo in the early evening of the 25th. Your hotel stay for those two nights is included in the race entry fee. All transfers for you and your equipment to and from the race venue are provided. Email jay@racetranscr.com with any inquiries about the race and flights. A registration form will go live on September 12th. After 100 aplicants a wait list will start. A full itinerary will be emailed out before January 1st. International travel insurance is mandatory for all participants. Trip cancelation insurance is highly recommended. Registration is transferable but non refundable. For 2018 we are excited to add a full 12 day trip to the TransCR, revisiting the original 2017 venue. Having retrned to San Jose on the 25th, riders will be treated to white water rafting on the famous Pacuare river the following day. That evening will feature a special dinner in San Jose. The next morning the group will depart to Providencia to camp and ride at the venue of the 2017 race. The next 2.5 days will be spent shuttling and riding high jungle descents free of the pressure of the race clock. The group will return to San Jose on the 2nd where accommodation will once again be provided at the Barcelo hotel. Contact jay@racetranscr.com for further info. Planning and preperation info will be emailed throughout the lead up to the race. The TransCR Enduro is supported by some great partners.